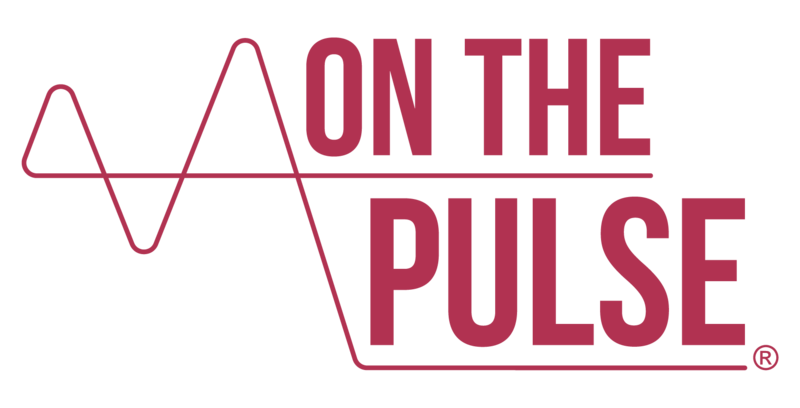 Posted on May 10, 2018 May 10, 2018 On The PulsePosted in Factor This! For almost three decades, Laureen Kelley has dedicated herself to educating and improving the lives of individuals and families impacted by haemophilia, both at home in America and throughout the developing world. Over this time, Laurie has cemented her status as one of the most respected and beloved thought leaders in global haemophilia advocacy. 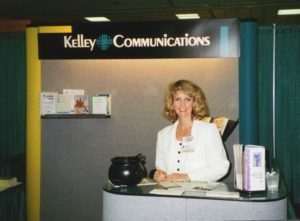 Her company, LA Kelley Communications, Inc., has been a popular provider of educational resources and leadership training for the bleeding disorders community since the early ‘90s. Laurie would later establish her own charity, Save One Life, to provide humanitarian aid and become a voice of the impoverished and disadvantaged affected by haemophilia overseas. She is a total trailblazer for caregivers, having raised a son of her own with severe haemophilia, and continues to support, empower and inspire others through her writing, books and international engagements. 1) Laurie, what’s your background to becoming active in the haemophilia community? Our son was born in 1987 with severe haemophilia A. It was quite a shock because it doesn’t run in our family. Without social media back then, as parents, we really felt on our own; pretty much in the dark about it all. Little by little, I began to meet families through a support group at our son’s hospital. I felt that the doctors knew a lot about treatment but were unsure about bringing up a child with haemophilia… they didn’t even have children of their own! It was obvious to me that the families understood more about day to day living with haemophilia than they did. To help other caregivers, I decided that I would start collecting stories. So, I advertised through an industry magazine. I was thrilled to receive more than 150 responses from all over the country! By the time I was done reading through all of them, a book emerged. Not just a book of stories, but a How to with advice. This became ‘Raising a Child with Hemophilia,’ which I first published in 1990. 2) How were those early experiences of caring for your son? I’m the kind of person that never spent a minute in a hospital, except to have a baby. I then found myself in one most weekends, having our beautiful little boy being poked and prodded with needles. This was on top of having a high-pressured job as an economist. I was absolutely exhausted; mentally, physically, emotionally and financially. You think life will never get better, but you slowly come to terms with the diagnosis and work through the tough stages of acceptance. I was also really lucky to have a very strong person in my husband by my side. He happened to be extremely knowledgeable about the scientific aspects of haemophilia. 3) Why did your husband already know about haemophilia? It’s a weird coincidence but quite incredible, too. He was a protein scientist, so would analyse the structure, function and interactions of proteins. In 1982, he actually worked on developing recombinant clotting factor for haemophilia[i]. He knew everything about that molecule. But of course, being in the lab is no comparison to the day-to-day experience of having a child with the condition. They’re totally different! I decided at that point, with his scientific knowledge and my passion for education, that together we made a great team to try to empower other people and families like ours. 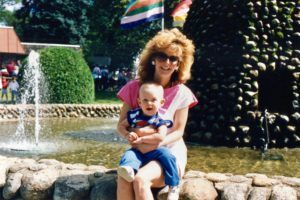 The popularity of ‘Raising a Child with Hemophilia’ led Laurie to set up her own company – seen proudly representing here at an industry conference in 1996. 4) What inspired you to set up your own company? I thought the book in 1990 would be my only major contribution to the community. But this luckily wasn’t the case. Originally, I received sponsorship from Armour Pharmaceutical, which was later acquired by CSL Behring. But after the book was published, other pharmaceutical companies began to approach me to do something similar. It would end up being a full-time job! This allowed me to write from home and look after our growing family. I also recognised the financial burden haemophilia can impose, so I always ensured that every book was free of cost to parents and still is today[ii]. It was then I started the very first newsletter for families, by families entitled, Parent Empowerment Newsletter (PEN). It’s still acknowledged today as being the oldest, longest running about haemophilia in the country! 5) Did you have a particular focus with your advocacy? Well, it was really difficult to be the parent of a child with haemophilia in the ‘80s. There was a lot of hysteria and misconception around contracting HIV from somebody affected because of contaminated blood products. Significantly, our son was born in the same month that the Ray brothers were burned out of their home[iii]. We are very fortunate our son is HIV and hepatitis free. I would find my strength in supporting other parents who weren’t directly involved with the HIV crisis, but still struggling to get by and make ends meet. 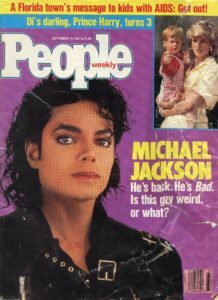 Front cover of America’s People magazine from 1987, reporting on the shocking story of the Ray brothers (top banner) – Laurie still has this very copy! 6) When did you start working in haemophilia outside of the US? My background’s in economics and international business. A Bayer sales rep named Nancy Wright suggested I should use my expertise and advocacy for haemophilia overseas. In 1996, I started travelling to developing countries, looking for potential leaders that we could train, equip and mentor. They could then help to bring their own local haemophilia community together, to educate each other and advocate to their government. It developed into a leadership training programme, which I ran for 10 years with funding from Bayer. I was truly grateful for this opportunity. 7) Where did you first implement the programme? In the Dominican Republic (DR). I was really shocked at what I saw. They were still using fresh frozen plasma (FFP) and cryoprecipitate. Although it’s a country just a one-hour flight away from Miami, they were backwards by 40 years! The doctors had no resources and the families were very poor. Fathers would carry their almost adult sons on their backs because they didn’t have any crutches or wheelchairs. It was obvious that we had a lot of work to do. Even so, we found a dynamite leader in Haydée Benoit de García. She’s intelligent, a natural educator and has a son with haemophilia. As with Haydée, you often find it’s the women that are the powerhouses in developing countries because they’re mainly at home caring for their children. They empathise with their suffering and will often have that driving ambition to make a difference. The DR now has a fantastic organisation and she’s still the president. Access to treatment has improved and the kids are growing up relatively healthy. I hope to return in July and it’ll be a lovely reunion. 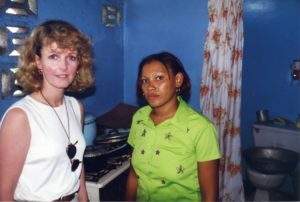 Laurie meeting a mum to three boys with haemophilia in the DR – her first ever home visit in a developing country (c.1998). 8) Have you had similar success in the other countries you’ve been to? Some but not all. Zimbabwe was difficult. I’ve been there four times since 1999, notably when Robert Mugabe displaced the mostly white, commercial farmers[iv]. I’ve seen the starvation of its people and a cholera epidemic. There are a lot of issues but the World Federation of Hemophilia (WFH) have since made inroads through their Humanitarian Aid Programme. I still feel like there’s a role for others like me to initiate some element of capacity building. We’ve done it in Ghana, Tanzania, Zambia and Kenya, where it’s all worked out really well. I think through our programme, we’ve been able to start about seven or eight haemophilia organisations. We’ve just set up another in Fiji. I’m now funding these activities myself but it really matters! 9) What’s the story behind Save One Life? It was a no brainer! In parts of Asia, the eldest son is responsible for the entire family. If he’s unable to provide for them, they could all end up living on the streets. It just seemed like an easy fix! That’s basically where the idea came from. The American Red Cross gave us our first donation, so we got started. 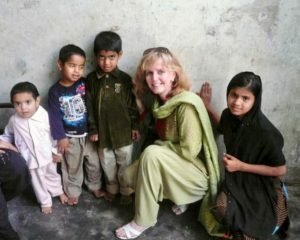 Up close and personal – Laurie bonding with children of a family affected by haemophilia in Pakistan (2012). 10) How many children is the charity supporting today? We’re in a growth phase right now. We have about 4-500 people around the world, including countries like the UK, Australia and Sweden, sponsoring 1400 children in 13 developing countries. It’s not only parents that donate, like the mum in New York, but leaders in industry and heads of speciality pharmacies, sponsoring groups of children. All our sponsors receive a beautiful information pack about the child’s background, with a yearly update on their progress. We enlist regional partners to implement the initiative on the ground. Sadly, we have lost some of our children due to the inevitability of limited treatment access. Yet, it’s so meaningful seeing others now in a position to support themselves and their families, with a brighter future ahead of them. 11) What are the main barriers to progress for haemophilia care in the developing countries? They’re facing a whole host of problems, not least extreme poverty. There’s simply a lack of education. We need to teach that haemophilia isn’t a curse from an evil spirit or a supernatural being, it’s a medical condition. We also need to inform them about genetics and offer these communities greater choices about having a family. When they arrive, there’s still no guarantee of treatment. At this point, the damage has probably already been done! Where there is clotting factor available, there’s never enough and the majority of product stays in the capital cities. That’s what Project SHARE tries to help. Since 2002, we’ve been shipping unused or unwanted product donated from US patients, pharmacies and treatment centres directly to those who struggle to travel or are in a bad situation. Together with the WFH, we’re hoping to ‘close the gap’ in care. 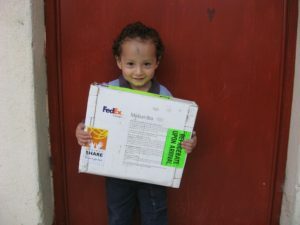 One of the children in Guatemala clutching his clotting factor shipment provided through Project SHARE (2014). 12) How does this contrast with treatment access in America? We have the biggest market share of clotting factor consumption in the world! I estimate that the haemophilia population in the US counts for 4% globally. But we consume 33% of the world’s supply of factor. There’s a plethora of products available here and more coming down the pipeline, but how will we pay for it all? Our treatment is very expensive and we have a convoluted insurance system. With more product than people, I think gradually we’ll see consolidation in all areas. There’s also a lot of leftover product, which gets given to Project SHARE, so that we’re able donate on average 7 million international units (IU) abroad every year. Since 2002, we’ve donated 113 million IU to over 75 developing countries! 13) What more can we be doing to help make a difference? 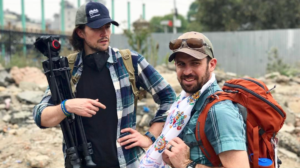 I’d love to see a generation of people like Patrick James Lynch and Chris Bombardier , who are going the distance to help raise awareness of the realities of haemophilia care across the world. We have a lot of work to do medically, psychologically and economically to help these families. I’m relying on the next generation of advocates to take up the reins and push our community forward… I’m not getting any younger! Save One Life is as much your programme as mine. If you’re financially able, please sponsor a child. Or group together and contribute. Also, make a commitment to put global issues on your local and national agendas. Don’t forget about the WFH, either. They need ambitious, socially conscious people to volunteer and cultivate change. You’ve got such great mentors in Europe like Brian O’Mahony and Mark Skinner in the US. Pick their brains and learn as much as you can, then apply it in the field yourselves. This is an incredible community of people! As society becomes ever more connected through the likes of social media and different technology, perhaps we can leverage this information sharing between us – more than we already are – to strengthen healthcare capacity and improve treatment access for our brothers and sisters in need overseas. Laurie wants to see a generation of haemophilia advocates like Patrick Lynch and Chris Bombardier – pictured here together in Kathmandu, Nepal (March 2017). Laurie’s advocacy ‘footprint’ is far reaching and commitment to equality unwavering. We’re certainly encouraged to take more action and will be making our own pledge to Save One Life to support a child. If you would like to know more about donating to Save One Life, head over to their webpage or email: contact@saveonelife.net. We can’t thank Laurie enough for speaking to us! She will be in Glasgow, Scotland for the WFH 2018 World Congress between 20-24 May and we’re really looking forward to seeing her there. As always, please join the conversation and share any comments with us on Facebook or Twitter using the hashtag #FactorThis. [ii] The complete list of published books by LA Kelley Communications are available here. [iii] The Ray brothers – Ricky, Robert and Randy – all had haemophilia and gained national media attention in 1986 when they were denied entry into their Florida school, having contracted HIV through contaminated blood products. They eventually returned under a federal court order but a week later, their home was mysteriously burned to the ground, as reported by The New York Times. It is considered a landmark case in the history of HIV in the US. [iv] The Guardian newspaper reported on the land seizures across Zimbabwe in 2000, available to read here. Feature image design created by Two Cubed Creative.